Even though it was a short work week, I am ready for the weekend. It’s always a bit exciting to return to work refreshed after the holiday but then all the items that piled up while on break quickly make you want another holiday. Ha. So this weekend I need to stop by the library to pick up a couple of holds. I’m going to try and not venture over to the new books shelves but I make no promises. I can’t wait to watch Sherlock, read my latest issue of Art Journaling magazine and check out the Most Anticipated Books of 2017. Have you seen this list? Oh my, books by J.M. Coetzee, Haruki Murakami, Penelope Lively and many others. Get your pens ready to take note. Speaking of pens, did I tell you that I have a new Lamy? 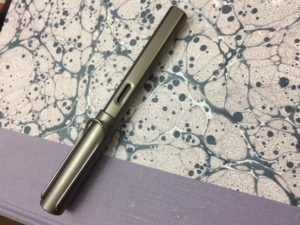 My husband got me this beautiful new Lamy with a black chromium-plated steel nib, which definitely feels different from my other Lamys when writing. I also have a vibrant blue ink to try out so I think I’ll be spending some time with my journals this weekend. I definitely can’t wait for the weekend to come. School started this past Tuesday and my eldest daughter is the only one who’s most excited considering she’s entering secondary school. 🙂 Next week will be the start of school week since this week they’re all about orientation and activities. That sounds like an absolutely lovely pen. That’s one of our new year’s resolutions, to buy two nice, new refillable pens; I’ll keep this one in mind when we begin searching! And I’m with you on the short-week-long-week thing: I’m so ready for this weekend that it’s not even funny. Enjoy! Love you new Lamy! I like Lamy pens very much, so affordable which is why I have several. And did you know you can change the nib? Very easy to do and gives a person so many options from fine to bold to a few calligraphic sizes. Have fun journalling with your new pen! Now that the holidays are over and break is done, January is such a long month stretched out ahead of us, isn’t it?! I saw that list of new books–lots there to look forward to! Nice pens are a treat, aren’t they?